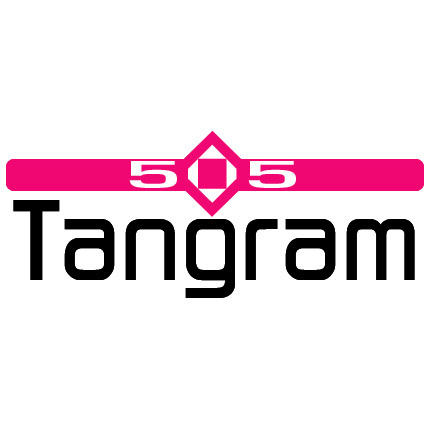 There's a wealth of puzzle games on DSiWare, but 505 Tangrams is the first tangram-based title to hit the shop so it's got the genre all to itself. How high does it set the bar for future tangram titles to match, though? If you're not sure what a tangram is, allow us to enlighten you. You're given a silhouette, here in one of five themes – animals, objects, people, shapes and twins – and you have to completely cover it with the geometric objects given. You'll have an array of squares, triangles and other shapes of varying sizes that can all be rotated and flipped to match the outline perfectly, and once you've completed one silhouette puzzle you can move onto the next. The controls are straightforward and make moving your pieces easy. You drag shapes with the stylus and rotate them by holding one of the white dots at each corner and moving it in a clockwise or anti-clockwise motion; to flip a piece, double-tap it. There are button commands as well, which let you manoeuvre the object with the D-Pad and alter its orientation with the face buttons, the shapes snapping into place when they fit into the outline fully. It's a smooth system that lets you concentrate more on solving the puzzle at hand than on figuring out how to flip the pieces around. Should you get stuck on one puzzle you can skip to the next by dragging a slider at the bottom, with your progress held in the DSi's memory until you exit the software. 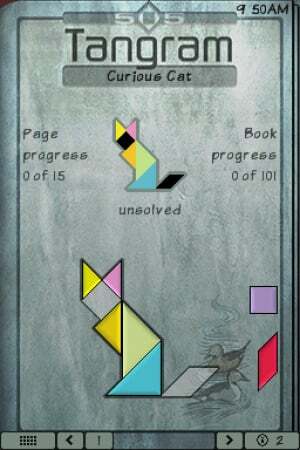 It's a welcome feature to have a temporary memory, allowing you to come back to a tough puzzle after trying something new, and if you get really stuck, there are hints available to help you progress. Regrettably, there's no save function mid-puzzle, so if you leave the software you'll have to retrace your steps as it were. Of course, it saves your overall progress, so you don't have to complete previous puzzles each time you power up. With 505 tangram puzzles in the package you're paying less than a Point a puzzle, which is good value however you slice it. Many of them are locked until you complete the available stages, however, so don't expect to go racing ahead. A counter tracks various statistics: your fastest stage clear time, how many puzzles you've completed and so forth, and you have the option to change the graphics to one of six tile sets depending on your personal preference. There's not much to discuss on the audio front, with a single ambient track that loops in the background lending the game a meditative atmosphere as well as some simplistic sound effects. It's functional, but little more. 505 Tangram is an unassuming puzzle game that doesn't try to be more than it is: a collection of over 500 tangram puzzles with good controls. It's often surprisingly addictive, with a classic "just one more puzzle" feel to it, and if you're after a slightly different experience in the genre, you could do far worse than this shapely title. I've always enjoyed tangrams. Seems like it'd be fun. Sounds interesting. I used to enjoy this type of puzzle when I was younger. When/if it comes out in the US, I may download this. Thanks for the great review. 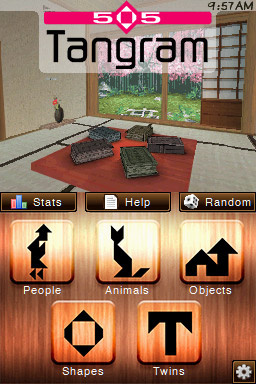 Tangrams is a great way to pass the time, I'm surprised no one has thought of a DSiWare game before. May look into it. You know, I think I might have to download this if it jumps the puddle. Provided I obtain the necessary points. I love these type of games and hopefully we get this in the US soon! This looks OK. Probably not gonna get this one. The moment i saw videos of the game i instantly compared it to the Neves-games on DS and WiiWare. And somehow i thought it would only be a bad copy of this series. I'm glad to see i was wrong. So actually i could imagine myself downloading this once i've got a 3DS. I guess there isn't a free play mode? My favorite part of tangrams was always arranging them in random positions. Still have about half a game to finish with Neves Plus. did you know "tanagram" isn't a word according to spell-check? I think tangram puzzles are all supposed to have the same number of pieces. Just downloaded this and I love it Very minimalist and relaxing. This reminds me of 3-D Mahjong, same company? I love that one, too.